Part of protecting a structure against outside elements is directing precipitation away from areas susceptible to water damage. Well-installed gutters can prevent structural issues and even add significant curb appeal. From minor repair to full installation, PI can take care of your gutter needs. Seamless rain gutters make up almost 80% of all rain gutters installed in the U.S. This popular type of rain gutter is made at your home for a perfectly fit to your eaves. Using seamless prevents breaks in conventional gutters of every 10 ft and, more important, prevents leaks. Our “Factory on Wheels” comes right to your home. 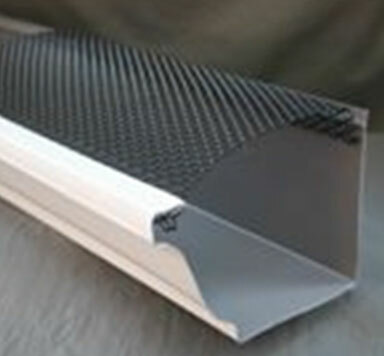 Seamless Aluminum Rain Gutters come in different sizes, weights and colors. In areas that get a lot of snow, a heavy weight (.032″) aluminum is used. This prevents warping by snow and ice. Gutter Guards – Gutter Guards for your rain gutters will protect your home from the worries of clogged gutters and water damage. Gutter protection keeps leaves and debris out of your gutters. Doing so not only improves the functionality of your gutters, but also keep you safe off the ladder. Gutter protection protects more than just rain gutters; it protects you, your home, and your loved ones. Cleaning out rain gutters is the most dangerous job around the home, and also one of the dirtiest. What truly is nastiest job around the house? 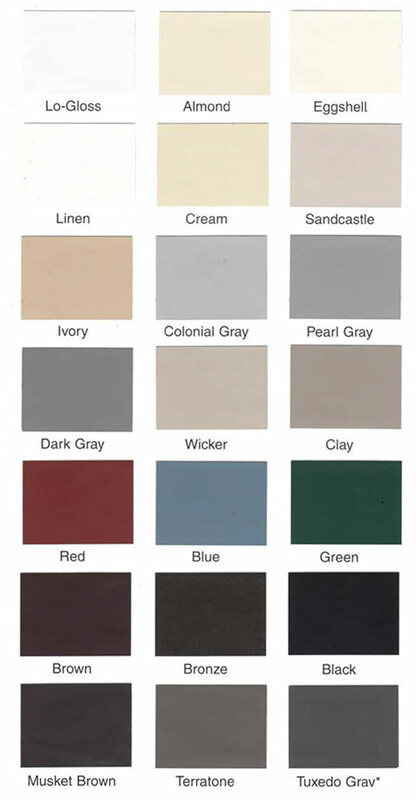 *Note: Please stop by our location in Panama City for color wheel or ask your salesman so you can view the true color sample. Damaged fascia, soffit, or outside wall. Leaky gutters can cause damage to a house’s structural integrity by allowing water to damage the fascia, soffit, or wood framing of the house. If you’re the kind of person who doesn’t want to be bothered with the time and money repairs demand, you should replace your gutters at the first signs of rust. Rust will often show up as little orange speckles that show through the paint, rusty colored stains at the end of the downspouts, or at gutter seams that are separated and leaking. Gutters rust from the inside out. When they begin to show rusting on the outside, the inside is rusting through. Often, however, because of standing water, the gutter may need to be repaired in just one or two areas. First of all, you must ensure that the gutters you are purchasing will be durable and that they come with a warranty that proves it. We recommend seamless aluminum gutters and downspouts, these are thick enough to be durable in the event of being hit by tree branches; seamless gutters is the keyword here, seams often begin to leak over time. With a seamless gutter manufactured on site with our gutter truck, you’ll get continuous runs of gutter so that there won’t be glued or caulked seams in the middle. I really cannot tell you how much it will cost to install new gutters on your house, you will have to schedule a free estimate, at the end of your estimate you will know exactly the cost of all the materials needed and the labor, estimates will take less than an hour to complete. Absolutely! No job is too small or too big for us. We strive to give you the best service you deserve, therefore, we do not discriminate against small jobs, we install from one or two pieces of gutters to whole apartment complexes or an entire subdivision! No, gutter repair is rarely successful, and your investment is far better made in new gutters. We do service on any gutters we have installed if any should ever be needed. Absolutely, after the job is completed our organized crews clean the work area so not to leave a mess for our customer. 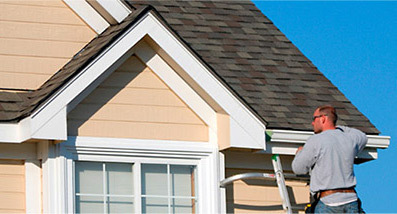 The gutters and downspouts that were removed from your house are neatly loaded in the truck and discarded of properly. We believe that you should not see anything of our work but the clean lines of your new seamless gutters when we are finished. 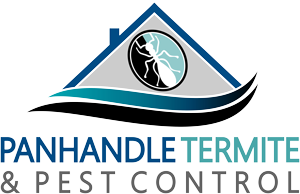 Yes, we are fully insured! Certificates of insurance are provided upon request.